Play isn’t a break from learning—it’s the way young children learn. Open-ended, child-directed play teaches cooperation, communication, problem solving, self-regulation, motor skills, and much more. 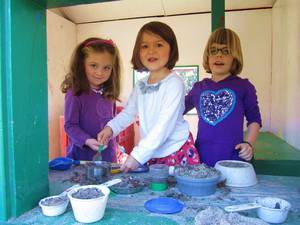 Child development experts agree that play is essential to early learning. Play helps children build the skills necessary for critical thinking and leadership, learn to solve problems, and build self-confidence in their ability to learn. 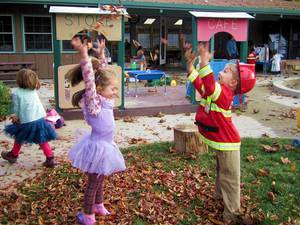 Learning to work together while playing—in the sandbox, with a tower of blocks, or during dress-up role-playing—teaches cooperation and communication, as well as problem solving skills. Including their peers in their play helps develop appropriate social skills, while being flexible when the group chooses a different plan develops emotional maturity. By playing with play dough and using tools like paint brushes and markers, children are developing the fine motor skills they will need later when they begin to write. Lifting and building with blocks, using shovels in the sand, and climbing on play structures all build large muscles which develops gross motor skills, balance, and coordination. These intellectual, social, emotional, and physical skills are all best learned through play and are the foundation for building higher-level skills in later years. Unfortunately, once children leave preschool, they have fewer and fewer opportunities to work on these skills. Our program includes both an extensive period of time for children to choose their own activities from a rich environment as well as organized group activities, such as circle time and snack time. Every day, our teachers carefully prepare our classroom, inside and out, so that children will have the opportunity to experience a wide variety of activities incorporating language, fine motor, gross motor, cognitive, and problem solving skills. It is important to note that throughout class, the teacher and parent-teachers are circulating among the children. They engage them where appropriate and expand their learning and vocabulary, teach children how to negotiate and resolve conflicts, and observe so that needs of each child is met. It isn’t “just play,” but play-based, allowing the young child to learn what she needs to learn in the best, most developmentally appropriate way.